The #techbelgium community grew out of a collective desire to facilitate communication between the tech communities in Belgium. This is a Slack community of tech-minded people where we can all talk, share experiences and ask and/or answer questions. In a search for a good platform to engage and communicate with communities of tech-related topics, many of the prominent community leaders decided to join forces and start this Slack community, a place where people can interact with each other to widen their horizons and those of their peers. Go ahead! Grab a chair! We'd love to see you joining our community. Don't hesitate to join this Slack community if you even have the slightest interest in anything tech related and beyond. We host beginners to experts in many different fields and areas. Everyone is welcome! Join communities of tech people in Belgium in many different areas, software to hardware, frontend to backend, developer to designer, etc. Chat to other like-minded people. Ask them questions, share your experiences, acquire knowledge. Collaborate with other communities. Want to run code in a container on an IoT device through the cloud? Here you'll find the right people to help you every step of the way. Learn something new every day, by absorbing content that get's shared by others. Spread your wisdom with others. TECHBELGIUM is dedicated to providing a harassment-free environment for everyone, regardless of gender, gender identity and expression, sexual orientation, disability, physical appearance, body size, race, age or religion. We do not tolerate harassment of participants in any form. - Any content which is not in keeping with the Code of Conduct. - Misogyny, ableism, sexism racism, nationalist insults etc. - Links to anything which would break the rules if posted directly. - Posting any private phone numbers. - Advocating criminality or violence. - Misdirection or deceiving links (such as to sites which hijack the browser, etc.). - Defame, abuse, harass, stalk, threaten or otherwise violate the rights of others. - Abide by the rules. 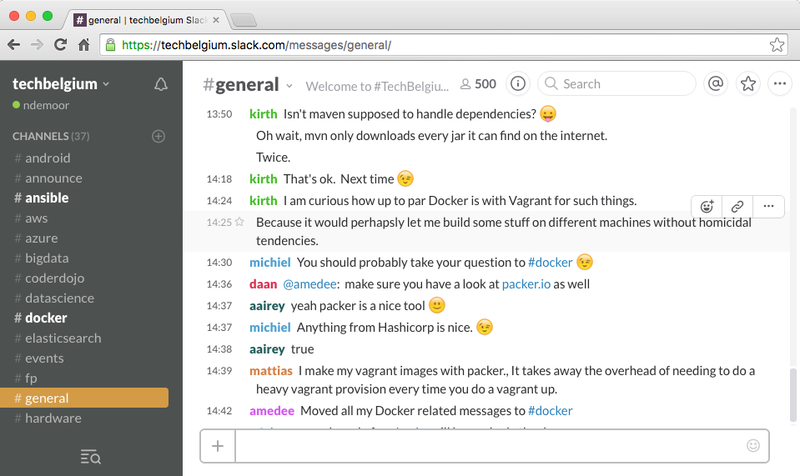 Techbelgium is a slack channel for people interested in the Belgian tech industry.